The attachment to the land is a common trait among people. Confiscating the land of a community can be the equivalent of the confiscation of its identity, history and future. Between the Palestinians and First Nations in Canada and the United States, there is an intrinsic connection as both peoples were colonized and forcefully stripped of their territory and resources. Both peoples have a deep relationship with, and responsibility to the land, and when that land is taken away, the culture is destroyed. This year’s commemoration of Land Day on March 30 came amid a turbulent international context, notably in light of U.S. President Donald Trump’s declaration of Jerusalem as the capital of Israel, an announcement that ended all hopes of a peaceful settlement to the conflict. Like the colonization of Indigenous lands in North America and the squeezing of Indigenous peoples into tiny spaces called “reserves,” the colonization and appropriation of Palestinian land has been unrelenting since the establishment of Israel. Today it’s accelerating at a startling speed. Palestinians inside the Occupied Territories as well as in diaspora have commemorated Land Day since 1976, when violence erupted in the wake of the Israeli government’s decision to expropriate Arab-owned land in northern Israel to build Jewish settlements. In the confrontations with the Israeli army and police in 1976, six Palestinians were killed and about 100 wounded. Forty-two years later, and almost the same scene played out again this year, but with even more blood and brutality. “Non-violent struggle is the most powerful means available to those struggling for freedom,” says Gene Sharp, the founder of the Albert Einstein Institution, a non-profit organization dedicated to advancing the study of non-violent action, in his book From Dictatorship to Democracy. 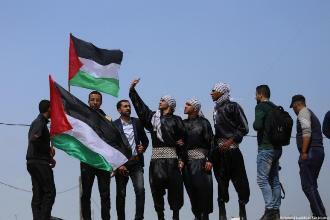 The violence of the Palestinian national movement has long been criticized by many commentators in the West. If only Palestinians employed “Ghandhian tactics of non-violent protest,” we often hear, Israel would have shown greater respect for their rights, and Palestinians would have their state by now. During each Land Day, tens of thousands of unarmed Palestinian protesters are doing just that as they march peacefully, demanding to regain their land. These tactics of mass non-violence are Israel’s worst nightmare, because they threaten to belie Israel’s claims of victimhood. Israel has reacted to Palestinians’ non-violent resistance with tactics of violence and intolerance similar to those employed by the Arab dictators who were toppled during the Arab Spring. While the Arab Spring uprisings represented a stand against ruthless dictatorships, Palestinians are standing up against what is often perceived by the West as one of the “most democratic” countries in the Middle East. But just as Arab dictators used violence and brutal repression against unarmed protesters, Israel’s security forces have shown no reluctance in using similar coercive means to repress unarmed protesters. According to a Reuters report, 16 Palestinians were reported killed on the Gaza Strip on March 30 as Israel used force against tens of thousands of demonstrators who had gathered along the Gaza-Israel boundary. The killings continued, and on April 6, another 491 were injured after they were shot from across the Israeli border. Well-known Palestinian journalist Yasser Murtaja was among the dead. He died from a gunshot wound while filming in the area. These are not “clashes,” as western media outlets like the BBC and the New York Times framed them. They’re massacres. There’s no other word for it. Today, Palestinians in Israel and the Occupied Territories continue to struggle to maintain ownership of their land. Land Day will remain an annual succinct reminder for millions of Palestinians in the Occupied Territories and in diaspora, especially for those who still cherish the names of the hometowns they may never see again. “They leave and we stay, and the land will remain ours. Today we are stronger, stronger than all the epics.